Welcome to Day Eight of The Escapist's Indie Developer Showcase, a 10-day celebration of the designers and programmers who have struck out on their own to make the games they want to make. Each day we'll feature a new game or demo by an up-and-coming indie developer along with a brief interview. Some games are already commercially available, some are works in progress, but all are free to play. To see who's on the schedule or check out what you've missed, click here. Enjoy! Even if you've never heard of Paul Preece or David Scott, the co-founders of Casual Collective, you probably know their work. Paul created the famously addictive Desktop Tower Defense, and David created Flash Element Tower Defense (the tower defense game that started it all). We spoke with Paul about his most recent project, the RTS-like multiplayer Flash game Minions. "Minions is a team-based multiplayer strategy game where two teams of six players, each controlling a single Minion, battle to destroy each other's towers and base. There are eight different units to choose from, each with their own unique skills and stats which make them play very differently from one another. 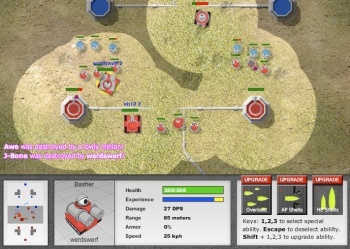 For example, Shouty is slow with low armor but can unleash multiple missiles and mortars on anyone who strays within range, while Basher with his twin cannons and high armor gets up close and personal with his enemies. As the battle progresses, each Minion earns experience which is spent on upgrading their weapons, making them stronger and more deadly. Teamwork is crucial to success as you rely on your own teammates' special weapons to help turn the tide of each engagement and ultimately push the enemy back to their base." Click screenshot to play game. "Debugging the client-/server-side code for the multiplayer engine is very time consuming and an area where no one will really notice the results of your hard work. But when we run the stats and see that some players have spent 17 hours over two days playing our game, it means we're doing something right! Wasting other people's time is always rewarding." "For us, a game is finished when no one plays it anymore. As Flash games can be easily updated and distributed, we continue to work on our games for long after they are released." "The scale of the games we're producing now suit our casual gaming audience (and our two-person development team). Although, we do have a pirate game we'd love to spend a developer-year making as soon as we get the right talent on board." "You assume we have a life, outside of making games!"